Andrei Arimia recognises how important the University and the numerous facilities available on campus were to his overall development. After graduation I’ve joined a graduate scheme, working as a junior pre-sales consultant at an independent service provider based in central London. After just one year I got the opportunity to join a large IT company, Hewlett-Packard Enterprise, where I’ve spent two years working as a networking pre-sales consultant. 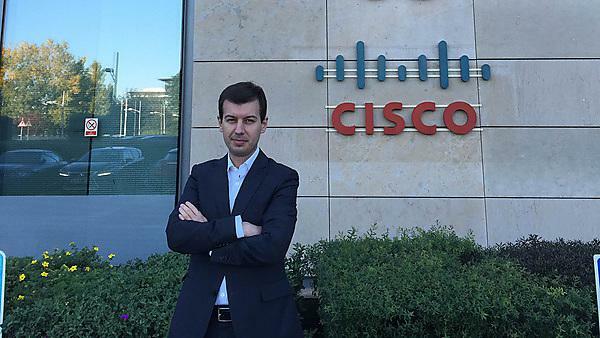 Currently, I am working as a pre-sales systems engineer for CISCO, a leading global technology company that designs, manufactures, and sells networking equipment. Yes. From, “I want to be a network engineer” as a student, it has changed to network architecture and design. Going straight from university into work was very difficult because the daily situations you encounter are far more complex than anything you’ll read in a book. Luckily, what I learnt at Plymouth University helped me to overcome these challenges. Have an open mind and don’t be afraid to step outside of your comfort zone (as often as you can), because amazing things usually happen when you least expect them to; technology is a fast changing area and you need to be prepared to reinvent yourself quite often. Studying at Plymouth was one of the best decisions I have ever made. I have improved and developed both my technical and my interpersonal skills, and that has opened up a whole new world to me. I gained a lot of confidence and was able to step into the corporate world with the right attitude. I would highly recommend Plymouth University to anyone looking for a place to learn new and exciting things, with great support from lecturers who were always open for collaboration. Also, I would recommend the University for the Career and Employability Hub and the excellent library facilities; and, on top of everything, you get a nice city with amazing sea front.